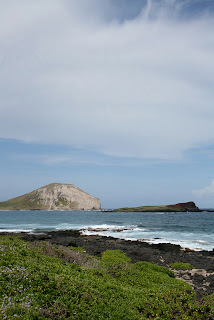 My wife and I had the pleasure of traveling to Hawaii for a friends wedding, and on one day, when we slept in and most of our other plans fell through, we found ourselves with a half a day of free-time, so being the kind of person that I am, I suggested that we look into renting a motorcycle and do a little riding around the coastal roads of Oahu. When calling around to see what was available, the selection was paltry, to say the least. Mostly heavy HD cruisers or tiny step through scooters, neither of which were my taste. However, I eventually stumbled upon one place that carried a newer Triumph Bonneville, so I jumped at the opportunity. The gentleman who answered the phone was pleasant and event told me he'd give me the rest of the day (6+ hours) for the 3-hour rental rate. Sweet! hugging every curve of the island. So we grabbed our stuff and walked the handful of blocks to the shop and signed the paperwork and picked up the keys to a 2009 Triumph Bonneville. The heritage look of the overall design works surprisingly well with the more modern looking wheels on the black one that we picked out, though the fake carburetors were kind of a goofy touch, given the bikes fuel injection. The low flat seat made pillion accommodations surprisingly comfortable for the wife and we got set quickly and headed out onto the streets of Honolulu. Being what it is, it was no surprise that the somewhat heavy feeling Bonnie became nicely light and sprightly once you got moving. Low speed maneuvering, especially with a passenger, feels heavy, in spite of the wide bars. And while the seating position is upright and comfortable, for me, it just did not offer the level of control that I am used to, since I mostly ride a sportier bike. However, once the grunty twin is fired up and the copious torque at low RPMs is used to get the bike up to speed, it all starts to make sense. The slow and heavy steering gives way to light easy effort and the pounds seem to just melt off as the speed climbed. We hopped on the freeway and made our way out of the city, heading east towards the windy mountain roads that we had driven days before. With somewhat limited time, we avoided making the usual stops and just rode for a big. The non-existent wind protection was not terribly problematic at these cruising speeds, but I could see it getting tiresome after a longer ride. Of course, I was also concerned as we had not come to Hawaii planning to ride, so we were not in our usual bevy of protective gear. It was weird riding in my street clothes and even weirder riding without gloves. And while not required, my wife and I opted to take the shop up on its free helmet offer, though the brain buckets were likely to do little should anything have actually happened. Tossing the Bonnie through some corners and cruising along the ocean, this was what motorcycling was all about. The sun, while warming, was tempered by the cool breeze coming off the ocean making for some wonderfully comfortable conditions. And for a relatively low tech ride, the Bonnie was proving to be quite the entertaining partner, especially when kept to the sane speeds dictated by traffic. 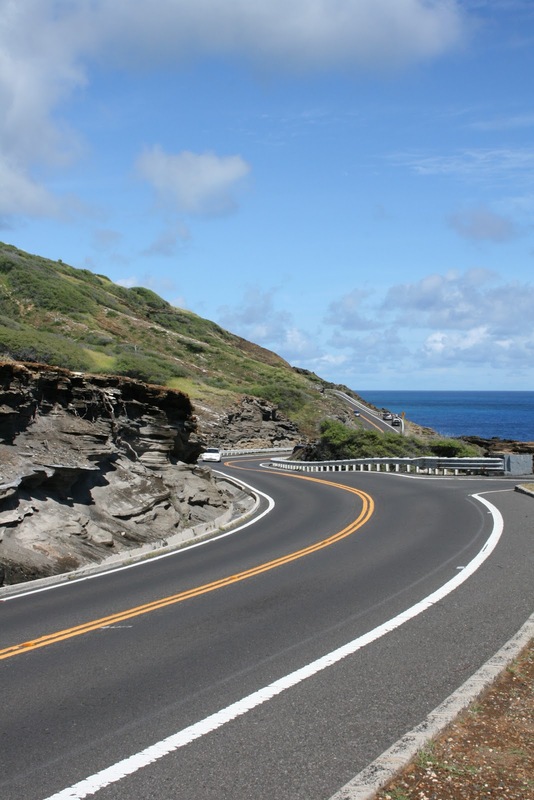 The roads on Oahu, outside of Honolulu to the east become a collection of fast sweeping turns that hug the curves of the island, allowing one to enjoy not only the beauty of the island, but also the amazing views of the ocean. It really is an amazing place and should be a stop for any motorcyclist. With a half day worth of riding behind us, I was disappointed that we had to return the Bonnie at the end of the day. In fact, the brief time my wife and I spent with this bike has me contemplating getting one of our own as an around town, local jaunt, two-up bike which I think the wife would love. Or, I guess we could just keep coming back to Hawaii since I suspect my location may have had some influence on my demeanor. Regardless of all that, the Triumph Bonneville shows why it is one of the longest enduring designs in the world. It's comfortable, handles well, torquey enough that you never feel like you would be caught out for power while running around the city, and it is so simple that maintenance should be a breeze. It just goes to show that sometimes, when you keep things simple, they can all come together and just work. The Bonneville proved a wonderful companion during our time with it and really added that extra little bit to an already awesome vacation. This trip started poorly, with weather forcing the cancellation of an important leg of my flight to South Carolina and a re-routing through a city over 100 miles away. Of course, as the opportunity presented itself, I jumped at the chance to spend some time behind the wheel. Stepping off the slightly rickety-feeling prop plane in Hilton Head, SC, I strolled up to the rental counter and before long, had the keys to a 2013 Chevrolet Malibu LTZ. 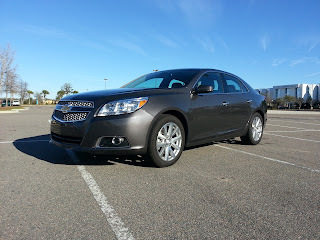 The gray-brown metallic sedan stood alone in a sea of mediocre SUVs and made me glad I had opted to take the sedan instead. I was not a fan of green cars. To me, they were always pitifully under-powered, insect-looking, miserable little cars that could never meet the real needs of an enthusiast. When I was growing up, electric cars were little more than glorified golf carts and hybrids had been adopted by such a particular set of buyers that being remotely associated with that group made me sick to my stomach. Deep in my psyche, though, I knew that the era of the fossil fuel swilling internal combustion engine would have to draw to a close someday, quite possibly within my lifetime, but as an enthusiast, I saw no viable alternative. Then, a ray of hope breached the gloom, illuminating an underdog manufacturer scrambling to demonstrate that electric vehicles did not have to be horrible, whiny, plasticky pieces of junk that crept along at a snail's pace. The arrival of the Tesla Roadster marked a turning point in my paradigm, opening the door to a whole world of possibilities of alternative energy powered vehicles. Sure the Lotus-derived roadster had some rough edges and the range was still far below that of a fossil fuel powered car, it at least demonstrated that electric cars could not only be fun, they could be stylish as well. 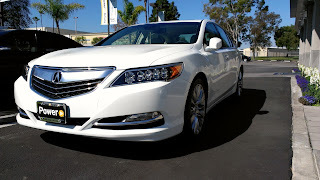 Power Acura of South Bay received their allotted two demo units of the 2014 Acura RLX and I had the good fortune of the dealer contacting me for a test drive. Both my brother and I have been following the development of the RLX quite closely, so naturally, I could not pass up this opportunity. 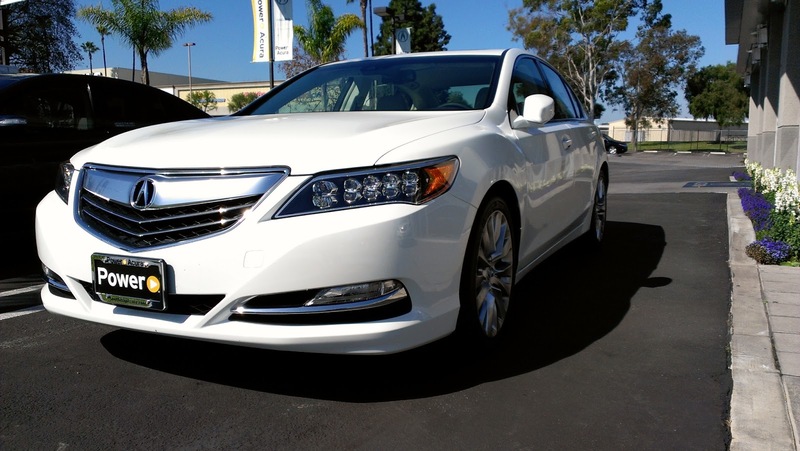 The two units Power Acura had received were a white tech package model, and a dark blue advanced package model. Unfortunately, the general manager of Power Acura had decided to take the advanced model home with him, leaving only the tech package available for preview. Earlier this winter, I had the occasion to pay a visit to the Tesla store in Santa Monica, CA where they had the Model S on display. While I have seen the Tesla Model S in photos, this was the first time that I had seen the luxury EV in person and I must admit, it looks every bit as impressive in person as it does on paper. In addition to being able to see the exterior, I had the opportunity to sit in the car and play with some of the controls, touch the surfaces, and see many of the cars basic functions in action. Unfortunately, a test drive was not in the cards, but I was able to spend enough time to get some good impressions of many aspects of the car. Top Gear USA had its season premier a few weeks ago, and the topic of the episode was about the cars the hosts owned when they were in college. Tanner Foust owned an early 90's Eagle Talon, Adam Ferrara had an old Cadillac and Rutledge Wood owned an old VW micro-bus. After watching the episode, it got me thinking about the cars my brother and I owned when we were in college, and some of the things we did with them. Looking down the line again at the sad collection of GM products, I spotted a 2011 Toyota Prius. 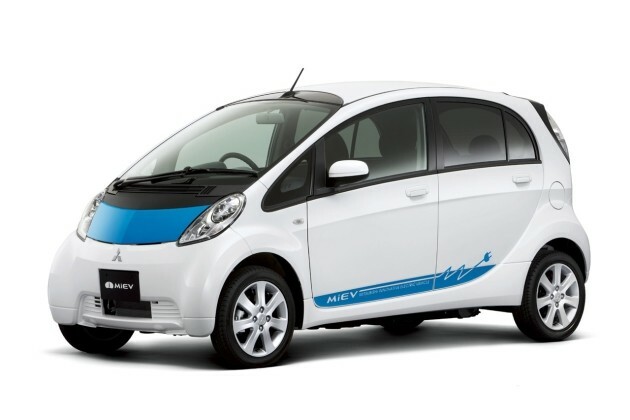 Figuring that since the fuel was expensive ($3.73 a gallon for regular was the norm on the island) and that we needed some practicality, the fuel sipping hybrid with its hatchback shape might just do the trick. So we quickly rushed over and claimed this one, before anyone else could beat us to it. Getting into to Prius, the layout of the interior felt odd and somewhat disconcerting, with the instruments way out towards the base of the windshield and centered in the car, rather than in front of the driver. While I had driven with this layout before, it is something that I have never really been 100% comfortable with. After getting situated in the seat, my hand fell to the nub of a shifter that looked like some sort of candy colored vestigial limb. I am still not quite sure why Toyota bothered with keeping this feature. Perhaps it was to make people feel like they were in a car and not some spaceship? Foot on the brake, push the start button, and the dash begins its dance, but not a peep to be heard. It is an odd sensation getting nearly no aural feedback when starting a car. Looking up at the dash and checking to make sure that we were "Ready" to go, I slide the shifter into reverse and am greeted by the shrill cry of annoyance that I would be intimately acquainted with during the next week. Yes, the Prius beeps every time you put it in reverse. That sound made me want to crash the thing every time I heard it just so I would not have to hear it again. Out on the road, I began playing around with the different buttons on the console and steering wheel, quickly discovering the 3-D overlay effect used for every press of a button on the wheel. It is mesmerizing and a totally unnecessary distraction to the driver. Maybe if Toyota would take some of that engineering time to sort out the rest of the rather blah interior, all might be forgiven. Getting onto the highway, with the car set in Eco mode, I ever so slowly managed to crawl up to the 50 MPH speed limit. Holy crap this thing is slow. I swear there were bicyclists passing us by accelerating up to 25. As much as I wanted to squeeze the entire trip in on a single tank of fuel, I knew I could not tolerate using this mode the entire time. Over the course of the next several days, I got to acquaint myself with the characteristics of the Prius even more, playing with the different settings and learning a sense of the chassis. 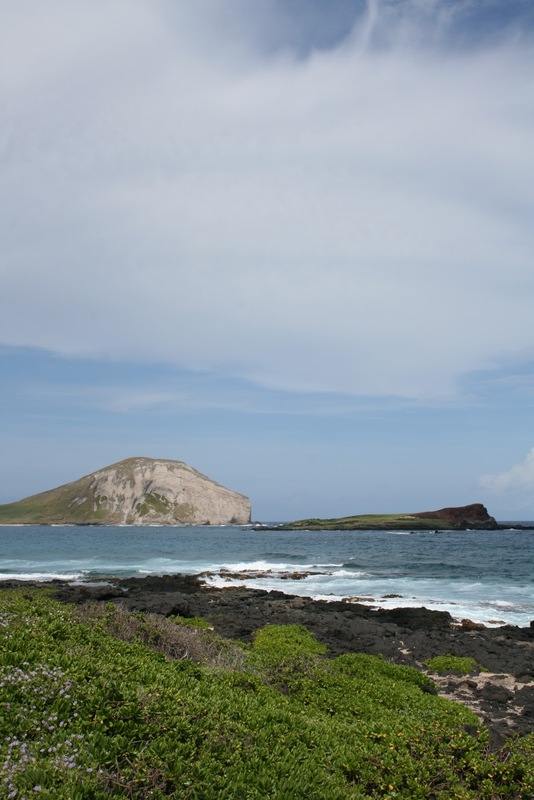 Oahu is a driver's dream during the off-peak hours. There are miles and miles of windy twisty roads for one to explore and are lined by lush green vegetation on one side and sparkling blue oceans on the other. Driving around in this environment makes even the Prius tolerable. To be honest, the Prius actually tracks surprisingly well, despite the skinny tires and tiny wheels. While the steering is clearly overboosted, there is adequate feedback for the amount of speed that can be attained. There is certainly little engagement for the driver, but as an appliance for getting from A to B, it really is quite easy to get comfortable with. In fact, it is almost relaxing since without even the capability to compete with most cars on the road for position, it is easy to just stay in the middle lanes and cruise. So while over the course of week, where we saw a wide variety of weather conditions and enjoyed the fantastic scenery, I gradually began to understand why people like the fuel sipping hybrids. Even with driving around the island and traveling over 400 miles, we averaged close to 50 mpg driving normally. And while I still would never purchase a hybrid for myself, I have finally come to realize why there are people who like these contraptions and why they drive the way that they do. Definitely not an experience I plan on repeating anytime soon. The next trip we have lined up, I am looking to work a proper sports car into the plans. Any avid Xbox and Xbox 360 owner will know of Microsoft's Forza Motorsport series of racing games. When it was first introduced on the original Xbox back in 2005, it was clear that Forza was clearly aimed at competing with Sony's Gran Turismo 4 for the Playstation platform. Both games focus on automotive realism and track driving, rather than arcade style racing games such as Electronic Arts' Need for Speed series. The difference between Forza Motorsport and Gran Turismo though is that Forza is generally seen as being easier to get into that Gran Turismo as Forza's tuning options are much simpler than those of Gran Turismo's. In the end though, you have two great racing simulators on two different consoles. Forza Horizon, released last year in November for the Xbox 360, is a completely different direction for the Forza game series. Looking to muscle in a bit on the arcade style racing game category, Forza Horizon attempts to takes the simulated realism of the main Forza Motorsport series and takes it to the streets. Horizon sees you playing as a young, up and coming racing prodigy, looking to take part in the annual "Horizon Festival," located in the fictional city of Horizon, Colorado. Your ultimate goal is to become the champion of the Horizon Festival and dethrone four time Horizon champ, Darius Flynt. The fictional city of Horizon, Colorado occupies roughly 63 square miles of virtual real estate. Forza Horizon encourages the player to explore all 63 square miles by placing races all throughout the city, and also leaving hidden "barn finds" for the players to discover. Every road in Horizon, even the dirt ones, can be driven on. As expected, Forza delivers a graphically beautiful game. From certain angles, it can be difficult to determine whether a still shot is in-game footage or a real life photo. Adding to the graphical splendor, Horizon now includes daytime and nighttime, meaning those headlights on your car now actually get some use. For the most part though, Forza Horizon basically borrows all the graphical cues from Forza Motorsport 4, which is not a bad thing since Forza 4 is an incredibly beautiful game. Everything from the in-car camera to the landscape of the fictional city of Horizon, Colorado looks absolutely stunning. Even if you get tired of racing, just picking a car and driving around the beautifully rendered roads of Horizon is an experience in itself. Forza Horizon's game play is really not that far off from Forza Motorsport 4. The physics of both games feel roughly the same, but with the main difference between the two being that one takes place on closed course tracks, and the other one on city and suburban streets. The one type of course not available in Forza Motorsport are dirt courses, yet Forza Motorsport 4's physics engine handles dirt courses incredibly well in Forza Horizon. Dirt courses cause the car to rumble and slide, just like what you would expect from driving on a real dirt road. Attempt to take a car with racing slicks onto a dirt course, and things can get very amusing, very quickly. Thankfully, Forza Horizon does include the option to buy specialized rally car equipment, but at a cost. More on that later. Many of the races in Forza Horizon are very entertaining. Horizon does include the standard closed course lap races and point to point racing available in every version of Forza Motorsport to date, but also tries to include many more race types. One of the more amusing race types involves racing against an aircraft, a lá Top Gear. Your first opportunity to race against an aircraft involves racing a 1969 Ford Mustang Boss 429 against a P-51 Mustang. What some may deem as a good thing, others may deem as not so good. While removing the tuning menu from Forza Horizon lets Forza newbies get into the game much quicker, it does remove the primary element of adjusting your car for specific conditions. Rather than tweaking your car to a specific track or race type, you just have to hope that the pre-adjusted settings are to your liking. Also, the physics of the game, while still very good, do feel slightly dumbed down from the Forza Motorsport series. Turn 10, the studio behind the Forza series, wanted this game to be more arcade like in its focus, but that focus comes at the expense of the realism that made Forza Motorsport a true challenge. Gone from Forza Horizon is the giant list of cars made available in the main Forza Motorsport series. Granted, Forza Motorsport never had the same gigantic list of cars Sony's Gran Turismo series had, but more than half the cars available in Forza Motorsport 4 are missing from Forza Horizon. Granted, Horizon does have some new cars not available in Forza Motorsport 4, but the choice of available cars feels very constrictive. I also miss being able to pick your first vehicle rather than being stuck with a Volkswagen Corrado VR6 by default. Sure, there is nothing really wrong with the car, but it is probably not the car I would pick as my starting vehicle. Turn 10 seemed to try a bit too hard making Forza Horizon hip. A lot of the one liners spoken by your various rivals throughout the game are incredibly cheesy. The races against aircraft, while cool, are a blatant rip-off of BBC's Top Gear. If the developers were going to include Top Gear like challenges, the least they could have done was let Jeremy Clarkson narrate part of the game like they did with Forza Motorsport 4. Of course, just like any other game today, Forza Horizon is available with a plethora of downloadable content...at a price. I can understand charging a small fee for monthly car packs to keep the game fresh, but charging roughly one-fourth the price of the full game to include a "Rally Mode," a mode which the game should have had to begin with, seems a little absurd. There are plenty of dirt roads around the city of Horizon, and quite a few races already take place on these dirt roads, so having a "Rally Mode" right out of the box seems like common sense. Of course, if you are willing to pay for the downloadable "Rally Mode," then more power to you. Personally, I feel that if I have already spent $60 on the game, why in the world should I pay more for something that should have been included in the first place? As mentioned before, Forza Motorsport was designed to be a fairly realistic driving simulator. The physics of the main Forza Motorsport series was always done relatively well, with the exception of cars with torque vectoring all-wheel drive systems. Unfortunately for Forza Horizon, that sense of realism just is not quite there. You would think that Turn 10 would try and improve the realism of the game since it would give players an opportunity to experience their favorite cars on open streets, but Turn 10 instead opted for a slightly more arcade like approach. For example, I picked up an S2000 and modified it to include everything that was available on my own S2000. When I first took it out on the open road in Forza Horizon, the car felt twitchy and unsettled, even at freeway speeds. Having driven my own S2000 on a day to day basis for nearly three years, I can confidently say that the S2000 should not behave like it is going to oversteer all the time. Of course, my experience with Forza Horizon is with the Xbox 360's standard controller. Playing the game with a full racing wheel setup (wheel, gated shifter, three pedals) may yield a completely different result. From a graphical standpoint, Turn 10 got Forza Horizon to look as realistic as possible. Every car model looks exactly like the real thing, from the exterior of the car, all the way down to the details in the in cabin view. As mentioned earlier, it can be somewhat difficult to discern an in-game still shot from a photograph. Horizon's landscapes are also stunning to behold. The incredibly rendered environments along with the new day/night feature add to the stunning visual realism. Overall, Forza Horizon is a good game. It is fun, entertaining, and very pleasing to the eyes. Since a lot of the very technical details do not exist in Horizon, it is much easier for newcomers to the Forza series to get into that game, and hopefully branch out into the main Forza Motorsport series. However, if you are expecting a technical racing game in the model of Forza Motorsport and Gran Turismo, you may want to look elsewhere. This is definitely a game that I would recommend renting before making the decision to buy. If you do decide to buy it before trying it, give the game some time for the price to drop. Getting the game cheaper may help with the sting of having to pay for all the extra content. A matter of years ago, the US automotive industry was on the brink of implosion - sales to consumers had shrunk to dangerous levels, GM shuttered many of its historic brands in an effort to consolidate, and the foreign automakers were fast on the rise; eating everyone's lunch along the way. But earlier this year the revival of the US automakers became evident with the triumphant introduction of the seventh generation Corvette at Cobol Hall during the Detroit Auto Show. America's love affair with the American car has been burning bright again and Detroit has been making every effort to put the dark years behind it. And yet, while there have been some tremendous efforts in recent years (the Ford Mustang and recently updated Chrysler 300 come to mind), I still feel like there is a lack of substance beneath the veneer of recovery. Due to my day job, I travel a fair amount and that means spending a fair amount of time behind the wheel of various rental in a variety of different locations throughout the US. This means that, along with my regular testing of cars for this blog, I get to sit in and drive a lot of cars, some of which I spend a fair amount of time with. As is typical, a lot of the cars end up being from US automakers who still make large fleet sales a sizable part of their sales numbers. On paper, many of these cars appear competitive, offering attractive designs, loads of standard equipment, and reasonable pricing. In terms of innovation, most of these cars are a stutter step behind their foreign competitors as far being on the cutting edge, but there are areas where these cars are doing a fine job pushing the envelope. Point for point, they feel like they should be on par with their foreign counterparts, but as I spend time with them, I find that it does not take a deep scratch to expose what is really beneath the surface. Take the Cadillac ATS, the most recent effort out of Detroit to take on the perennial sport-sedan favorite BMW 3-Series. While the latest 3-series is no longer the ultimate driving machine that the earlier generation cars were, improvements in technology and engineering still make it a formidable competitor for American pocketbooks. The ATS, on paper, offers a product that goes toe-to-toe with the 3-series in just about every measure, even coming within millimeters of the 3-series in virtually all exterior dimensions. Yet, the moment I stepped up to the ATS and examined it up close, the gap between the quality of the two cars became immediately apparent. Starting on the outside of the ATS, simple things like trim-pieces look downright cheap up close and the little details such as sharpness of execution of door sill plates or the assembly of the trim in the trunk seem noticeably of poorer quality. Moving to the driver's seat, while the immediate visual impression is that everything appears of quality, running my hands over the materials reveals a very different impression, with harsh grain patters, hard plastics, and the general tactile feedback not meeting the expectations set by the visual inspection. Move from the front seats to the back, however, and even the visual sense of quality begins to disappear as materials noticeably cheapen and things increasingly feel like afterthoughts. Fire up the engine and two things immediately catch my attention: 1) the noise that the engine makes upon start-up was not given much consideration because it just sounds pedestrian and 2) the gauge cluster feels cheap somehow, despite the full-color LCD in the middle of it. Get on the road and the driving impression begins to reinforce the impressions left by the rest of car - the suspension is firm and provides fantastic grip, but gets unsettled easily; the steering is responsive without being communicative. Cadillac checked every single box it needed to check to make this car competitive on paper with the 3-series, and yet, the sum of the parts feels like it is just adding up a little short. This is my overwhelming sense when driving cars from American manufacturers these days is that, on paper, they make wonderfully competitive cars that check all of the right boxes individually, but on whole, the cars lack a cohesiveness that German and Japanese automakers have managed to engineer into their cars with an attention to detail that still eludes US automakers. Every time I drive an American car, I feel like each individual component was assigned to an engineering team to complete, but nobody thought to take a step back and look at the car as a whole to make sure every component played well with every other one. One possible exception to this is the recently re-engineered Chrysler 300 sedan I spent a weekend with last year. Somehow, especially when compared with the previous rendition, everything felt like it clicked. It felt like there was a grand vision for how everything should feel and that every component contributed to that vision. Things did not feel like they were individually created to a spec, but rather the whole car was designed with a singular goal in mind. It made the car feel like it was more than just a collection of parts and my experience with it was therefore immensely improved as a result. In the end, I am pleased that US automakers are at least trending in the right direction again. Ford, GM, and Chrysler have all made tremendous strides in the right direction and are finally putting out cars that, on paper, are able to match the capabilities of their foreign competitors. The next step that will allow them to truly match their competition would be to capture that essence of cohesiveness that is still sorely lacking in so many of their efforts. To do that, perhaps they need to start re-thinking how their cars are engineered or perhaps consider a shake-up of how the product requirements are identified when they are planning their new cars. I genuinely want to like American cars. In fact, my father would love to go back to owning a big American sedan and my father-in-law would love to make his next car entirely made and assembled in these United States. The car that is closest to meeting my criteria is unfortunately too large for my tastes and not nearly sporty enough. Nothing else I have driven to date from a US automaker offers quite the right blend of qualities to capture my interest. Maybe I am just not in their target demographic or maybe I am just being too exacting, but whatever the case, a consumer like me is one that US automakers should seriously consider when they design their next generation of cars. Perhaps building to that next level of exacting standards is precisely what US automakers need to do to get their cars to finally add up to more than the sum of their parts. I have always had a soft spot for Triumphs after hearing the triple on my friend's Speed Triple. And when Clinton Cycle in Camp Springs, MD offered the opportunity to test ride some Triumph motorcycles, I jumped at the chance. While the event offered a rather limited selection of bikes to ride, I did find the opportunity to ride a Triumph Sprint ST with Triumph's phenomenal triple motor. Firing up the motor, the bike makes the most beautiful sound, even with the stock exhaust system. Picking the bike off the side stand, it feels heavier than my Ninja 650 daily rider, but is not off-putting and with a seat height that is completely manageable for my 31" inseam, the bike felt only slightly top-heavy, especially given the more sport oriented ergos. Rolling out of the parking lot, the weight of the bike practically disappears. In fact, despite being a slightly heavy sport-tourer, at speed, it feels just as agile as a sport bike and is totally light and flickable, yet stable in even the most difficult corners. Pulling away from a stop, the sound of the triple through the Sprint's exhaust is downright intoxicating. Every roll-off the throttle triggers a cacophony of clicks and pops as the motor slows to an idle. Speaking of the 1050 motor, it is buttery smooth, with loads of torque down low. Every opportunity to rev it up when pulling away from a stop, I roll on the throttle just to enjoy the fantastic mid-range and strong pull from anywhere on the tach. The one surprise for me was just how stiff the suspension was. While I understand that in order to get the bike to handle well, it needs to be set up pretty stiffly, for a bike that is expected to eat up the miles, bumps seemed to transfer through the frame to the rider with a rather jarring motion, certainly much more jarring that a number of other sport-tourers that are on the market. Combined with the more forward-leaning riding position and the smallish fuel tank, I had some reservations about really using this bike for distance sport touring. But honestly, the wonderful 1050 triple is enough to make me overlook the stiff suspension and the other minor shortcomings. This bike has such a strong motor and rides so well on smooth roads that I cannot help but fully recommend this bike for someone who loves to carve the canyons, needs to commute, rides three (possibly even all four) seasons, but can only afford to keep one bike. It really is a wonderful ride and I have added this bike to my short list of potential purchases in the near future. I do want to try the new Kawasaki Ninja 1000 to get a comparison because that bike seems like it is the perfect competitor to this one. Thanks to Clinton Cycles for hosting the event. This weekend was to be epic. I was traveling into the Shenandoah mountains for the weekend with a group of friends to spend the weekend drinking Scotch and Bourbon, smoking cigars, and cooking on the grille. On top of that, I had taken the day off to ride the entirety of Skyline Drive before arriving at the cabin we had rented for the weekend. Needless to say, there was no better way to enjoy this warm summer weekend. The day started with me throwing the saddle bags on my trusty Kawi and strapping everything down tightly. Slipping into my gear and pulling on my helmet, I set off to begin my ride out to the northern edge of Skyline Drive, located in Front Royal, VA. But first, a quick detour to downtown DC to pick up a selection of cigars. Back on the road, I had opted to take the highway to quickly get to the start of the fun, twisty roads. Stopping briefly to fuel up both bike and rider, I paid the entry fee and set off for 100+ miles of nothing but twisty, curvy, enjoyment. Buttery smooth pavement greeted me, along with Skyline Drive's notoriously slow 35mph speed limit. Just minutes in, I was also greeted by the Park Police welcome wagon and picked up a tail for about 5 miles. But I kept my throttle judiciously applied to maintain exactly the speed limit and before long, Johnny Law decided I was too boring to keep following and peeled away, allowing me to cruise in peace. The temperature fell to a brisk, but comfortable level as I sailed deeper into the lush greenery. My mind cleared as my lungs filled with fresh mountain air and the sound of the parallel twin beneath me bounced off the road, filling my helmet with its pleasant thrum. This was nirvana and I was seriously alone to enjoy it. Not a soul in sight both in front and behind me for nearly the entirety of the 100 miles. Keeping a relaxed pace, I was able to sail through the turns, maintaining a single gear nearly the entire way and never once touching the front brake and only periodically dragging the rear to tighten my line for a corner. Everything in my mind evaporated and I just cruised, enjoying the view of a sapphire sky contacting the jade green treetops, interrupted only by this ribbon of ash gray road on which I was traveling. All too quickly, though, I reached the end of line. Up ahead, the Blue Ridge Parkway tempted with its many miles more of winding roads. Mentally kicking myself for not having allotted adequate time to go further, I did a quick time check and realized I would not be missed for another couple of hours. Recalling the many side roads that lead back onto Skyline Drive, I quickly decided that I would run through the middle section between Route 33 and Route 211. Ripping away down the road, I could not wait to get back onto Skyline for a little while longer. During the weekends, Skyline Drive is a mess, overcrowded with tourists and filled with law enforcement officers looking to fill their ticket books. However, during the week, the road is clear and the opportunity is there for the intrepid soul to take some time off to enjoy themselves. If you ever find yourself down in the mountains of Northern Virginia, set aside a little time to take the cruise from Front Royal down to Waynesboro on Skyline Drive. And, if you are a fan of wine, there are a number of great little wineries in the vicinity of Waynesboro to be enjoyed. Next time I will be looking to ride the Blue Ridge Parkway, but for now, the memory of this amazing day brings a smile to my face every time I think of it. This is an experience worth having for auto and moto enthusiasts alike. Take the time to get away from the world and create your own memories like this one. Editorial: Are Future Generations of the Volkswagen Beetle Forever Doomed to be Chick Cars? On the way to work Wednesday morning, I happened to pass by a new, 2013 Volkswagen Beetle Turbo. When I looked over, I noticed the driver was a woman. I started to think back to all the other Beetles I have seen over the years, and I noticed a trend. Nearly every New Beetle and "A5" Beetle I have seen to date has been driven by a woman, while the original Beetle has a well diverse mix of drivers. Noticing this trend got me thinking whether every Beetle introduced after the New Beetle would be forever doomed to be a "chick car." I was not around when the original Volkswagen Beetle was introduced back in the late 1930s. Heck, I was not even around for a good majority of the original Beetle's incredibly long life cycle, but the Volkswagen Beetle soldiered on until 2003, when the last Beetle rolled off the factory and in to the sunset. Throughout its life, the original Volkswagen Beetle has always attracted a very diverse crowd of people. Men, women, senior citizens, young teenagers, and people from all walks of life could be seen driving some form of the original Volkswagen Beetle. In 1997, despite the fact that the original Beetle was still on sale in some markets, Volkswagen introduced the New Beetle in an attempt to inject new life into the aging moniker. The New Beetle was a fairly big departure from the original Beetle. Overall, the car was more round and bubbly than the original. Volkswagen's paint pallet for the New Beetle included bright reds, yellows and even a neon green color. Car buyers and the automotive press immediately identified the car as being "cute." Over the course of the New Beetle's life cycle, I noticed that nearly nine out of every ten New Beetles I've seen on the road are driven by women. Everyone I knew that ever owned a New Beetle was a woman (with the lone exception of one guy who later traded his Beetle for a 8th generation Honda Civic Si coupe). The car's inherent cuteness seemed to attract droves of women to Volkswagen showrooms, all there to see the cute little "bug." At some point during the New Beetle's life cycle, Volkswagen even introduced flower shaped hub caps, and a flower holder for the cabin. With all these cutesy little additions, it is no wonder the majority of New Beetle buyers were women. At the very least, Volkswagen was pleasing its unintended target audience. With the New Beetle's production ended in 2010, Volkswagen soon introduced another new Beetle. On April 11, 2011, the 2012 Volkswagen "A5" Beetle, simply known again as just the Beetle, made its debut. Realizing that they needed to draw in a larger audience like with the original Beetle, Volkswagen's redesigned 2012 Beetle takes cues from the original Beetle of yore, mimicking the flatter roof line and overall shape while taking things in a more retro but modern direction. On the marketing front, Volkswagen attempted to market the car as more masculine, showing print and television ads of men driving and enjoying the Beetle. Admittedly, the 2012 Beetle does have more performance chops than the previous models with a revised Turbo model. The Turbo model shares the Golf GTI's 2.0 liter, turbo in-line 4, an optional DSG transmission, and a sportier suspension tune. But despite Volkswagen's efforts, it seems to me that mostly women are still drawn to the car. Of the six or seven "A5" Beetles I have seen scooting around the road (including the one I saw this day driving to work), all of them, even the Turbo models I have spotted, were driven by women in their late 20s to early 30s. Even when Volkswagen had the car on display at the Los Angeles International Auto Show this past November, most of the interested parties looking at the car were women. Upon seeing the car, my girlfriend had commented on how cute it looked. It seems the previous Beetle's "cute" curse had carried over to the new one. The "A5" Beetle has been on the market now for only a little under two years now, so it might still be a bit premature to pin the car as a "chick car." If my current observations about the previous Beetle and the current one are any indication though, the current Beetle is going to be forever doomed as a "chick car" as well. Considering the life cycle of the two previous Beetles, it is going to be quite a while before Volkswagen designs another Beetle. Perhaps next time, they will get closer to their goal of making it more masculine. Then again, maybe it just does not matter.